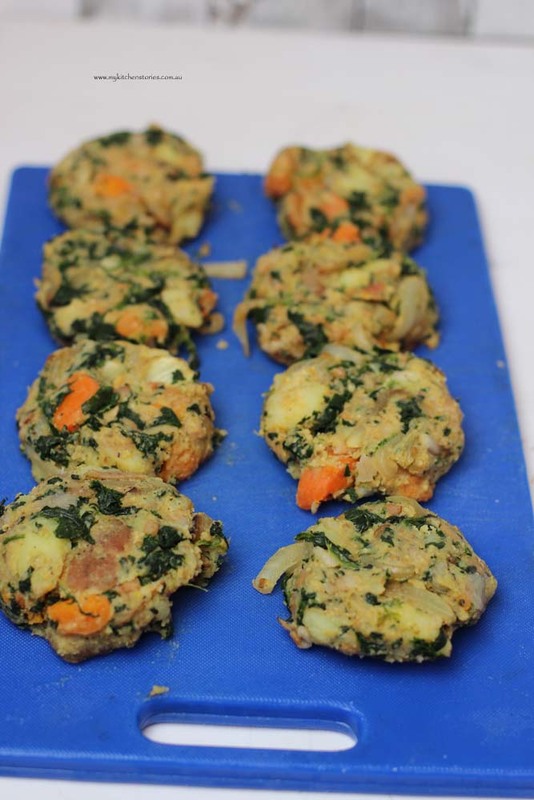 These are my Bubble and Squeak patties. I was inspired to make them after talking to English born Chef Ben Allcock. Mine are made from fridge leftovers but his are definitely not! Having a sly peak into someone else’s life is always a bit irresistible, it’s how we work as humans. I often find that a chef’s job is one of those jobs that people ask about, followed closely by winemakers and then God’s gift to the food world Cheese Mongers. What makes their workday tick?. 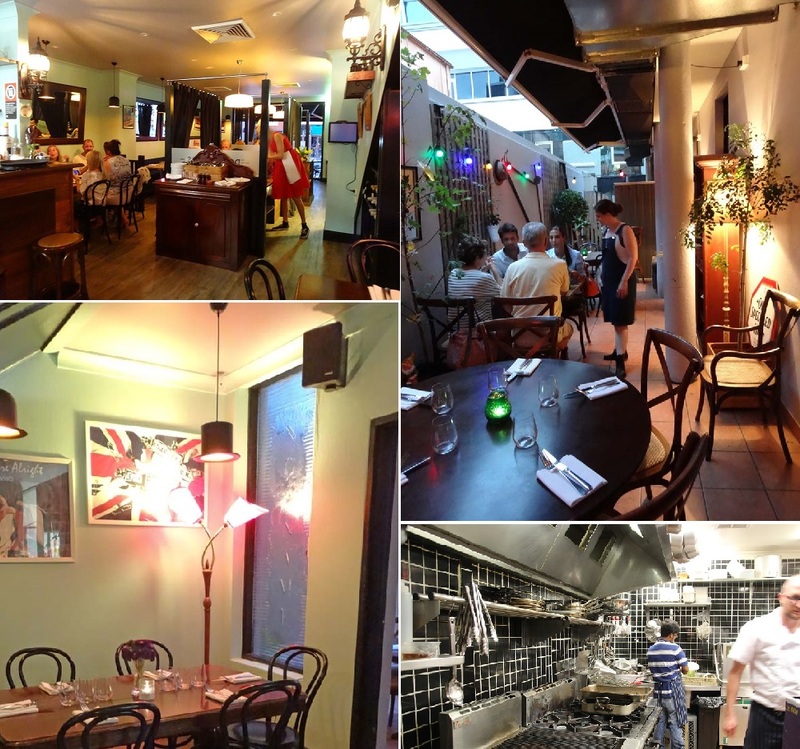 When I was having a chat to Ben, I asked him which dish he thought was one that defined the British feel of Downstairs restaurant in Stanley Street East Sydney. He paused and then easily told me it was definitely his twist on the classic and much loved English side dish Bubble and Squeak. It sounds simple but he went on to describe making it with such care and love that you can see he really enjoys what he does. He makes his version with caramelized eschallots and onions, potato and Brussels sprout leaves, kale, cabbage and thyme amongst other things that I didn’t notice because I just focused on how happy he was talking about them, but just so you know, they are pan fried till crispy and served with house made black pudding, herbs, soft eggs & HP sauce. He likes his job. Ben is from Essex and like a lot of chefs the kitchen seemed to be a place he could fit into. He left school early and began working part time as a Kitchen Hand. He was offered full time work as a chef when a position came up and he decided to take it after finding out that the junior chef job paid more than being a KH. Another chef is born. He obviously thrived because he has been a chef ever since. He kept a little recipe book writing down each recipe given to him to make. The first recipe he remembers being given by the Chef at the tender age of 16, was Creme Anglaise. He still has that book today. It is full of treasured recipes collected through the years at jobs from London to Sydney and back. It’s a story you hear a lot, Bens’s Mother was a good cook. He remembers never being fussy and eating everything put in front of him. Cooking wasn’t something he aspired to, instead it found him, and like a lot of young people that drop out of school it probably saved him in many ways. He is inspired by his peers and has a massive stack of books that he flips through when he finds the time. 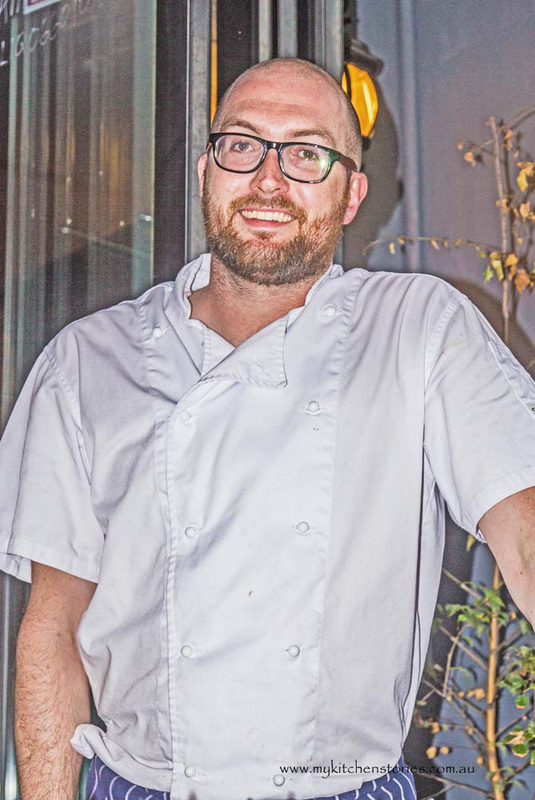 It’s interesting that his last job was in a gastro pub in Sydney, cooking English style food and that is where owners Derek and Dominique Easter first noticed him and hoped he would apply for the chefs position at their new restaurant. Ben says he really didn’t cook what you would call English food before this, and seems a little surprised to find himself here. So with lots of great produce and the freedom to modernize his heritage, he seems settled after this stint of 5 years in Sydney. Here they try to make everything they can in house and with only two full time chefs, Ben and his sous chefwork long hours augmented by part time helpers. 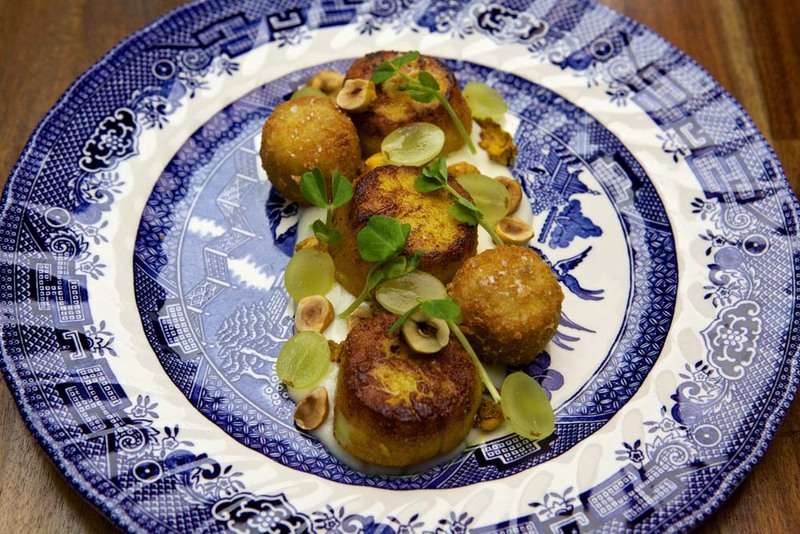 The shift work involved with being a chef can often make years run into each other with ease. The Hazy Rose bar upstairs is a cosy English styled bar also owned by the Easts’ that is a perfect place to hang before and after dinner and probably after work too!. A chefs day is long but if you ask Ben if he likes being a chef, there is no hesitation at all. It’s an emphatic yes! Put the steamed potatoes, sweet potato ( or other vegetable) and spinach into a bowl and set aside. Heat a nonstick fry pan on medium and then add the 30 gm of butter. Add the onion, thyme and bacon and cook on medium till nicely translucent and fragrant. Caramelise a little if you can because the sweetness from the onions will give lots of flavour. Add the onion mixture to the potatoes and the Panko (or rice crumbs) and stir together well. You will need just enough crumbs to help the vegetables dry out and stick together. Shape into patties with your hands. 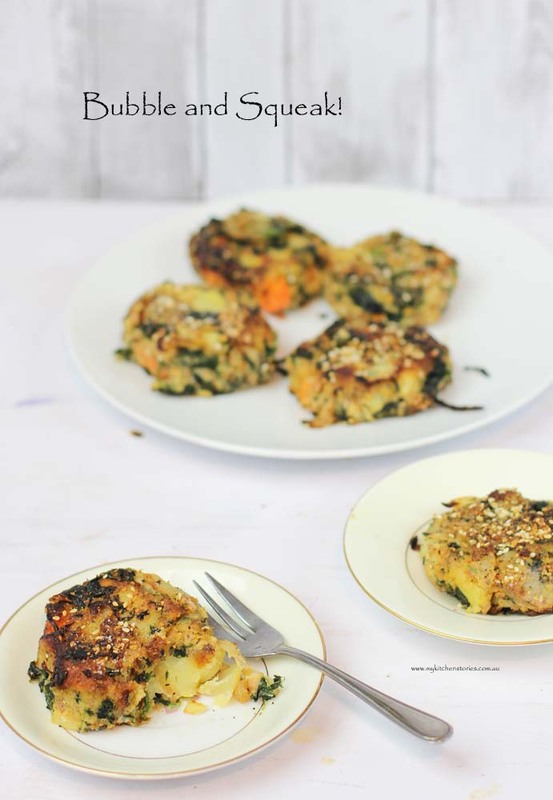 Lay each patty on a chopping board before pressing each one into the sesame seeds. Depending on your vegetables you could add an egg to bind this mixture. If you are using up leftover roasted vegetables that are a bit drier than fresh steamed ones it maybe hard to get them to stick together and bind with out a small egg. Roll a small amount of you mixture as described and try frying a test patty before adding the egg to see if yours will hold together well. Thank you for the introduction to Ben. 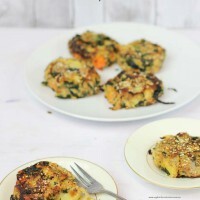 Loving this recipe for bubble and squeak! Yum.